Kisei Title Match in Spain! Takao to Challenge for Judan! The current Kisei title holder Iyama Yuta (W) defeated the challenger Yamshita Keigo 9-dan pro by half point after 245 moves. Iyama made a good start by winning of the opening game. The open side tournament for European amateur players was also held parallel to the the first game of the Kisei title match. In the playoff match to decide the challenger of the 52nd Judan title to Yuki Satoshi, held at the Nihon Ki-in in Osaka on 23 January 2014, Takao Shinji 9-dan pro (W) beat Iyama Yuta (Kisei, Meijin, Honinbo, Tengen, Oza, Gosei) by 5.5 points after 273 moves. Takao will play for Judan title match for the first time since 2009. Iyama has lost a chance to regain Judan title and to claim seven major titles simultaneously in 2014. `Aidu Chuo Hospital Cup' Women's Pro Tournament which is sponsored by Onchi Kai (Aidu Chuo Hospital). Tournament Format : All women pro players will play from preliminaries. 8 players will be qualified to the main tournament. Note: Women's title holder will be seeded to the main tournament. Rule : Time Allowance is 60 minutes per player and when a player reaches the final 5 minutes of her time allowance, Byo-yomi will begin. At the final game, finalists are given five hours per player for time allowance and it will be two days game with a sealed move. Kato Keiko 6-dan pro becomes the challenger to Hsieh Yi Min for Women's Meijin title. 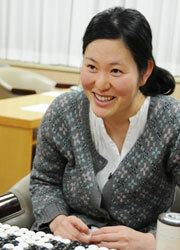 Kato will play for Women's Meijin title match for the first time since 2008. The first game of the 26th Women's Meijin title match (three-match series) will be held on 5th March 2014. Leon Stauder, a 20-year-old German, just started insei of the Nihon Ki-in Tokyo from 11th January 2014.